Nicolas Boillot is an artist and researcher in digital art since 2001. Franco-Swiss, he lives between Nice (F) and Berlin (D).
. The interest for abundance, but also the fact that the principles of fragmentation and recomposition are at the heart of the remix practices, explain why the collection is so present in the work of Nicolas Boillot. The collection as artistic practice is here, a source of inspiration and materials (collection of objects, images, sounds, use of the collection potential of IRC, Google images and Internet Archive) and a source of creation (as a collector and curator, he groups, sorts, re-arranges according to an intention). His early works are based on personal recordings (everyday objects for Re-initialized space, images and sound recording from a place for The resonant mosaic, from television spots for The advertising lyre). Initially, this constitutes small collections, except in the case of The advertising lyre which required the capture of 250 slogans from the sound recording television. This type of long and tedious work of capture also marks an era; the transition to digital will greatly facilitate it. In two more of his works, the collection is simply inherent in the flow of selected media: the potential flow of the television program (SamplTV) or a movie (Spoiler) that will be exploited by the device and the user. On the other hand, the Internet allows him the constitution of considerable collections (80 000 sentences in French and English from IRC for Plagiairc). Or to delegate the constitution of the collection to content platforms (Google Images for .urler). But above all, it is the collection that is at the heart of the intention of these two works. They seek, in fact, to question, in the case of .urler, the effects of the absurdity and serendipity of our navigation in the 'infobesity' of the Web and in the case of Plagiairc, the way in which the textual data are used, collected, archived and made available on the Internet. The question of copyright is at the heart of Nicolas Boillot's work. It is also closely associated with the principle of remix since the relationship to the original is essential. His first two works (Re-initialized space and The resonant mosaic) are based on materials of which he is the author. Spoiler uses a royalty-free movie. In doing so, it illustrates the contribution to the creation and the heritage role of online archival sites such as Internet archive. On the other hand, in his other works, the question of infringement of copyright is central. Either because it stems from a critical intention, the denunciation of the media in The advertising lyre and SamplTV, where the referential scope of the exhibited sound and images have been kept intact, and this, despite the fact that its contents are linked to an economic sphere where an Anglo-Saxon vision of copyright prevails. Or because it constitutes the very intention of the work, the work Plagiairc placing it at the center of the denunciation of the public and private use of our personal data. The question here is to ask from what criteria we can consider that a word still belongs to its author, according to the moral authorship right (droit moral) in French law. The artist here explicitly experiments with plagiarism and the limits of copyright, thus doubling the intrinsic questioning of the remix principle. In doing so, it raises the question of its trivialization which is at the heart of the evolution of practices related to Web 2.0. Because the culture of sharing operates to the detriment of the culture of property. Moreover, the specificity of his works also leads him to lose control of their broadcast and associated copyright. Be that as it may, he testifies here to the difficult double constraint thus imposed on the artist, the infringement of copyright also being an integral part of the principle of remix, in the sense of E. Navas. On another level, Nicolas Boillot has long been very sensitive to the intrusion of the "giants of the Web" (GAFAM) in our lives. This also explains why this question of copyright or its transgression is so important to him. The following figure shows the diversity of questions over his works. It also marks the place of the latest works Lambeaux, Loops and Wall trope developed during his research creation Ph.D.
- The relationship to time (as intention and principle of creation).The relationship to time (as intention and principle of creation). The digital artwork breaks with the linear flow of time usually perceived and makes several temporalities coexist. 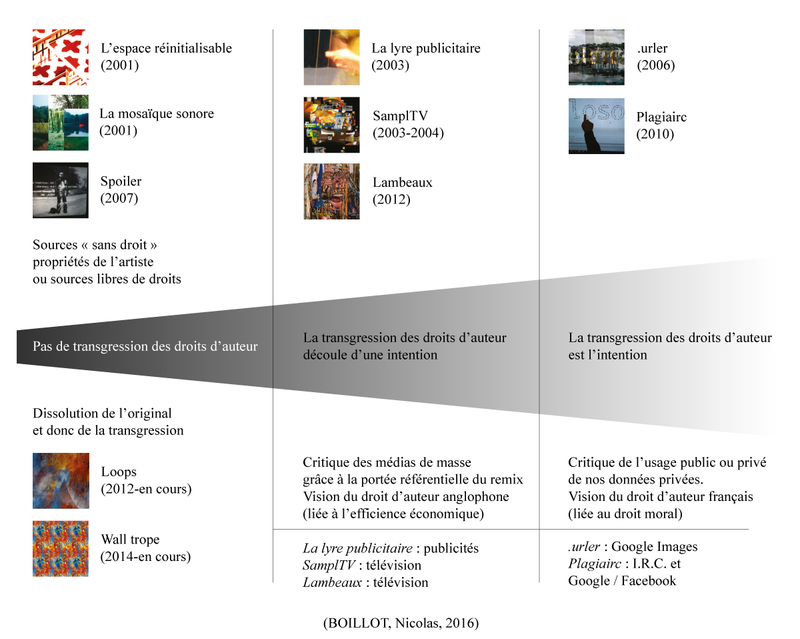 And the digital artist "destabilizes and recomposes time - instantaneity, simultaneity, incompleteness - to the point of making it a perspective" (Sauvageot, A. et L'église, M., 1999) by creating the specific conditions of an interactive work. This creative time is very present in the work of Nicolas Boillot: the concept of circular time appears with The advertising lyre and is very developed then in SamplTV and .urler. For example, SamplTV brings simultaneously into play a triple temporality: the temporality of the television broadcast in real time; the cumulative and retroactive temporality of the fragments in motion, reinterpreted and replayed unceasingly by the artistic device; and the temporality of the flow of the superimposed fragments diffused in loop and refreshed during this circular time. Moreover, time can be the very intention of the work. This is the case of Spoiler who proposes an unusual possession of space and time by bringing into play two temporalities from the hijacking of the film Night of the Living Dead: the temporality of the "actual" film (the action in real time) and the temporality of the "spoiled" film (the action, ten minutes later). The artist invites the spect'actor to be the trigger of this trip to the future; then to be the "revealing body" of the future of the event lived in the present. Spoiler thus questions our desires for anticipation, the fact that being able to guess the future can solve certain questions, but also suddenly annihilate all the tension and the hope of the present. As we can see, the relation to the spectator's time is fully summoned, according to a co-creation mode. Interactivity is therefore at the heart of the relationship to the artist's time, and this, in most of his works. Because only, Re-initialized space and SamplTV can exist without the intervention of the spectator. All other works require interaction. His works also attenuate the vertical distance with the audience by referring to a familiar framework (advertising, mass media, popular content platform, triviality of chat on IRC) and by proposing simple interfaces, familiar or fun (lyre, microphone, mirror effect of the cut-out figure, etc.). Note that Plagiairc is a particular work. If as in The advertising lyre or .urler, the familiarity of the device (here, the computer and Facebook / Google), the triviality of the subject (here, the interpersonal communication in its simplest form: the instantaneous exchange, the phatic link) and the conditioning of the work to the action of the spectator deliberately intended Plagiairc to an uninitiated public, Plagiairc goes much further. It engages the public in its private space (at home, facing her computer, interacting with her own contacts). Finally, note that interactivity also depends on the types of interfaces used by the device. The interfaces of Nicolas Boillot are here relatively simple, even familiar; but, his works linked to the Internet also bring into play the interactions identified by Jean-Paul Fourmentraux in the works of Net art (Fourmentraux, J.P., 2008) : "the interactions of contribution" (.urler and Plagiairc) and "the interactions of alteraction" (Plagiairc) because here, "collective action in real time" is the heart of his artistic project. Nicolas Boillot also places the question of the artistic device at the centre of his approach.The question of the artistic device. His work focuses on the digital remix and its referential and critical potentialities. He confronts with the definition of remix by varying the medium used, the source material, the predominance of a sound, visual or textual form or the diversion practices, creating ‘selective’ or ‘reflexive’ remixes. During his Ph.D in research creation, three of his works push the limits of the remix allowed in favour of a remix ‘distanced’, with a purpose more experimental than critical. This work, in constant evolution, has been the subject of several residences (Chile, Spain, France, Quebec) and individual and collective exhibitions in many countries (Germany, England, Belgium, Brazil, Chile, China, Spain, France, Greece, Iran, Italy, Japan, Quebec, Switzerland, USA, Taiwan, Czech Republic). 2014 GifBites, Gray Area Art, San Francisco, U.S.A.
2014 Virtual relocation, Goethe-Institut, San Francisco, U.S.A.
2013 #UPLOAD, San Francisco, U.S.A.
2013 DVD DEAD DROP Vol. 5, BEST OF curated by Fach & Asendorf, Museum of Moving Image, New York, U.S.A.
2012 RE/Mixed Media Festival, Brooklyn Lyceum, New York, U.S.A.
2004 The attractiveness of television and its manipulation by interactive interfaces.